For any bar, restaurant, or event serving cocktails, particularly mint juleps, this stainless steel julep strainer is perfect for you! Add just the right amount of mint and lemon to your refreshingly classic mint juleps with this stainless steel julep strainer. The julep strainer provides a bowl shape that will fit snuggly over cocktail glasses, while allowing liquid to pass through its holes. Be sure to strain out the unwanted, finer ingredients, such as herbs, that are not wanted in your cocktails! From mint julep pieces to lemon seeds, this strainer is sure to catch them all, resulting in a refreshing, smooth cocktail! The two-piece stainless steel construction on these is very durable and takes lots of abuse. We have ran these through the dishwasher many times and have yet to have a single issue. Quality strainer for a great price. It does exactly as described. It fits perfectly in my cocktail glass when making a Negroni or Manhattan. I would recommend this product to anyone or bar. What can I say, it works great for straining mint juleps. It was less than a dollar. The hole at the end of the handle allows me to hang it nicely from a hook. This strainer does what it's supposed to do. Use it for making all kinds of cocktails and haven't had any issues. Run it through the dishwasher with no issues. If you need a julep strainer, I recommend this one! Very solid and heavy metal. Lots of straining capacity. I also like the eyehole on the handle, it is great for hanging. While not my most used bar supply, it is still an essential product! I can use it to strain any drink, as it fits perfectly in the top of my pint mixing glass! Even after a lot of use, it still looks great, and has held up well! I highly recommend! Perfect for our bartender service, we learn how to use it and works great, this product shape its awesome, the stainless steel constructions its hard and very durable!! This strainer is great for cocktails. It's great to hold back the ice in any drink. I also like to use it to strain tea bag when making tea. And I love the size. Our old strainers allow many different parts of our cocktails to flow through while these capture those unwanted particles and allow just mixed beverage to shine. I always make sure to have some julep strainers behind the bar for straining cocktails. They are easy to use and easy to clean them. Works great for making cocktails and straining the ice from it. I use this as a regular strainer and the loop on the handle is great for stacking a few of them on a hook. Perfect for mint juleps! This julep strainer perfectly strains out anything and allows for a smooth pour into your drink. It's great to keep out any fruit that you're infusing into your liquor when pouring it into your glass. This strainer can be used to strain mint from juleps, or for any other kinds of cocktails. It works for fresh juice or ice as well. Stainless steel, easy to wash, small enough for easy storage. The stainless steel julep strainer is made of the finest materials and was huge help in the kitchen. I was quite impressed by the craftsmanship. Great value, this Julep strainer works well with my mixing glass. It holds up even after many runs through the dishwasher. and is a classic! I was nervous about this because of the handle size but it does work well straining fresh orange juice pulp for some. I hope they extend the handle at some point. For the price you can't beat these little strainers. I think the four-prong strainers are more generally useful, but these do a good job of holding back ice and mint. This is a great little Julep strainer. This fits nicely inside a pint glass and will strain out anything from ice and herbs to seed! This julep strainer works extremely well and is durable. It's good quality, but still cheat. I don't have to use it very often, but it's worth having around. This is an awesome julep strainer! You can use it for many things! You can strain pulp or a chunky gravy! Might use it for real chunky fruit juices to strain juice! This is a must have in any bar! this is another version of bar strainer. It is specially great for more experience bartender. Price and quality are great! We don't used these in the tradional sense. We use these to strain out smaller amounts of things such as fresh fruit preserves. The size makes it perfect for that. This julep strainer works extremely well and is pretty durable. It's cheap, but good quality. I don't have to use it too often, but it's worth having around. Generally not used much, but is very functional. Mint leaves get stuck in the spring of hawthorne strainers, with this you can just give it a little tap and they all fall off. This is not an essential tool for the bar (though some would disagree I'm sure) -- unless you like to showcase classic bartender skills and you make a lot of juleps. It was an affordable item and we do use it. This strainer is use for straining different fruits for our mix drinks, its small but not to small for bigger hands to use and the price is just right. This strainer is great for making certain cocktails but in general we don't really use this type of strainer. it's just not very useful for us. Transport yourself and your guests to a simpler time with this quality, affordable Julep strainer. One where Mint Juleps and sundresses, frolicking children, and snorting thoroughbreds abound. One where sweaty old men drool over the railing at Churchill Downs whilst they pray for a trifecta payday so they can pay their rent and buy a bouquet for their wives. This strainer spoon is awesome and you'll be glad you got one. I only bought this product because of the cheap price and my husband thinking it looks cool. I never imagined how many cocktails we would use it for. I thought that it would be something we used once or twice a year but it has proved to be a great tool to have in your bar. highly recommended. This product works perfectly as it should and for the price is almost unbeatable. The only issue with this product is that once it is cleaned it does not have a blemish free shine. Much more useful than we imagined. This julep strainer is also great for handling ice cubes without using your fingers. Looks much more professional and a great deal! It works exactly how it's supposed to. It appears to be made from good quality material, it doesn't feel flimsy or cheap. It's not ideal for all straining but it definitely has it's uses. Almost didn't buy this because of its size but really glad I did. There really is no substitute for this julep strainer when you are making a ton of juleps for a party. Kinda a one trick pony but does that job perfectly. Great, affordable julep strainer. This Julep strainer fits in mixing glasses very well, and is very effective. If you are looking for a nice, good quality julep strainer at a very reasonable price, this is a great one to purchase. This is a great basic stainless steel strainer. You can not beat the price. It works well for bartenders to strain ice from drinks but keep them chilled. Being on a limmited budget, I try to find multiple uses for a kitchen tool I consider purchasing, and although I do not make many Mint Juleps! I have found this tool handy in taking cooked eggs out of water, and catching up ravioli as they come to the surface. 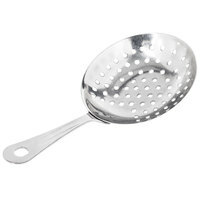 It's a small strainer, really sturdy, and great for small jobs around the kitchen. This strainer/scoop is great for easily filling cups with the right amount of ice. Eliminates the possibility of using the glass to get ice which could break and contaminate the entire ice bucket!! A good piece of bar equipment at a great price. A julep strainer is an essential tool for making cocktails, especially ones that are stirred in a mixing glass. This suits the bill quite nicely. I bought these because they looked cute and had no idea what I'd use them for. But I've found they're very useful to scoop ice from the freezer. They're far less frustrating than tongs which can propel an ice cube across the kitchen. A little more sanitary than grabbing at ice cubes with your hands, and scoops up just the right amount of ice for a beverage. We are serving a lot more mint juleps so we like these strainers. They're great for straining any kind of drink though because the bowl is really big.